For my previous director retrospective, I explored the films of Kathryn Bigelow — a female director whose works are often surprisingly interested in engaging with themes of masculinity. Following that, for this particular installment of my ongoing project, I thought it might be interesting to turn the “masculinity” up to eleven and look at the films of one of the “manliest” directors (and one of the most problematic people) to have ever done it: Sam Peckinpah. I’ve seen 13 (of 14) feature-length films directed by Sam Peckinpah. Here’s a list of the movies that I watched: The Deadly Companions (1961); Ride the High Country (1962); Major Dundee (1965); The Wild Bunch (1969); The Ballad of Cable Hogue (1970); Straw Dogs (1971); Junior Bonner (1972); The Getaway (1972); Pat Garrett & Billy the Kid (1973); Bring Me the Head of Alfredo Garcia (1974); The Killer Elite (1975); Cross of Iron (1977); The Osterman Weekend (1983). The Wild Bunch (1969) – No surprises here. Not only is The Wild Bunch my favorite (and many others’ favorite) Peckinpah film, it’s also one of the best Westerns ever made. Bookended by two of the greatest, most stylistically influential action scenes ever committed to film — the first a botched bank-heist and the last an assault on a Mexican fort — The Wild Bunch successfully navigates Western tropes while also complicating them. It serves as both an homage to the American West and a critique of the Hollywood system, resulting in one of the greatest anti-Western Westerns. Anchored by a phenomenal cast — including William Holden, Robert Ryan, Ernest Borgnine, Warren Oates, Ben Johnson, Jaime Sanchez, and Strother Martin — Peckinpah provides us with a group of rough characters. They’re mean, ugly, old, and tough as nails. [After all, one of the most memorable lines of the film from our “hero” is when he instructs his fellow bandit about how to interact with innocent hostages: “If they move, kill em!” Yeah…this is the movie’s protagonist.] But these characters also have a “code” of sorts and wrestle with feelings of shame, identification, betrayal, and responsibility (not toward society but, rather, toward one another). 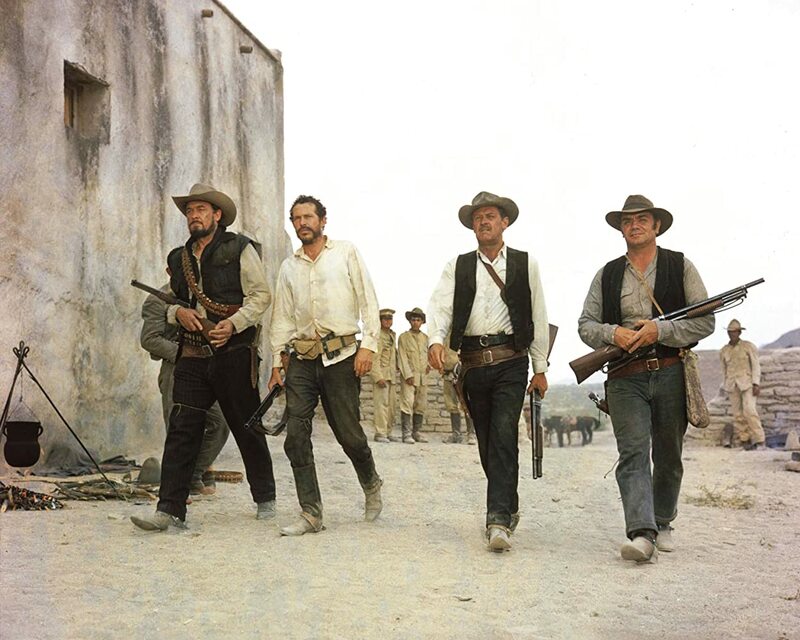 In addition to the realistic setting and characters, however, we also get the Peckinpah slow-mo action scenes and the spliced / looping editing techniques that draw attention to themselves as a film. The result is a text that is, paradoxically, a (highly) stylized (dirty) realism or…something. An absolute must-watch for those interested in genre and/or for fans of the Western. 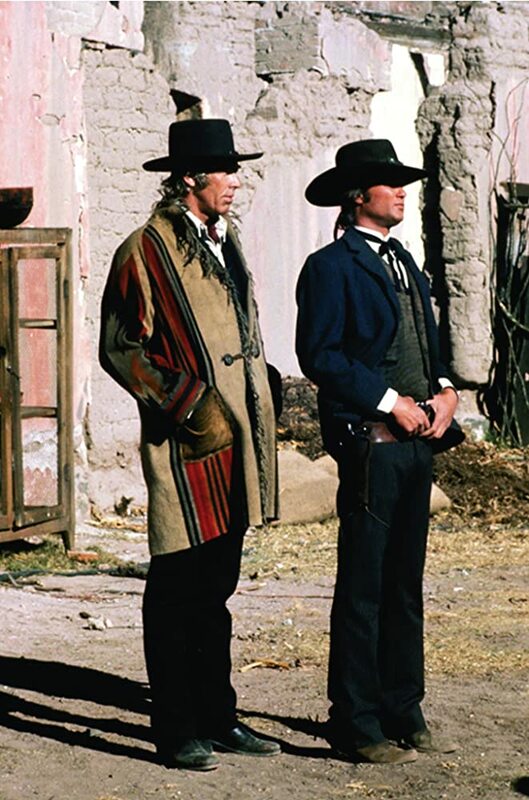 Pat Garrett & Billy the Kid (1973) – While both of Peckinpah’s great Westerns are about a certain brand of man who have outlived their usefulness in the American West, the style/tone of the two films couldn’t be more different. Whereas Peckinpah’s The Wild Bunch is all rough-and-tumble, his Pat Garrett & Billy the Kid is a slow, meandering, largely meditative film about lost friendship and feelings of displacement. The cast — full of Peckinpah favorites and old Western standbys — is strong, headlined by Kris Kristofferson (as the outlaw Billy the Kid) and James Coburn (as Pat Garrett, a former compatriot of Billy’s and the man tasked with capturing/killing the infamous outlaw). Bob Dylan also has a somewhat minor role in the film, as he was employed by Peckinpah to write the various songs for the film, the most famous of which is undoubtedly “Knockin’ on Heaven’s Door.” [In fact, one of the most emotionally resonant scenes in all of Peckinpah’s oeuvre involves a scene with this song and featuring Slim Pickens of all people, and yet, somehow it just works.] Unfortunately, this film didn’t do very well commercially upon its release, and its production / editing was apparently plagued by lots of problems: Peckinpah was drinking heavily at this point and could hardly work, the studio didn’t provide requisite crew (resulting in a faulty camera being used, which meant that much of the film had to be scrapped or re-shot), and execs instituted a terrible cut of the film that removed 30 minutes and, in doing so, mangled the film’s lyrical quality. However, Pat Garrett & Billy the Kid has thankfully been restored to its intended version and has since regained critical appreciation in recent years, so it’s one that you can now watch and enjoy as it was meant to be seen. Cross of Iron (1977) – Whoa! At the #3 pick, we’ve got Peckinpah’s penultimate film, Cross of Iron — a World War II movie based on Willi Heinrich’s novel, The Willing Flesh. 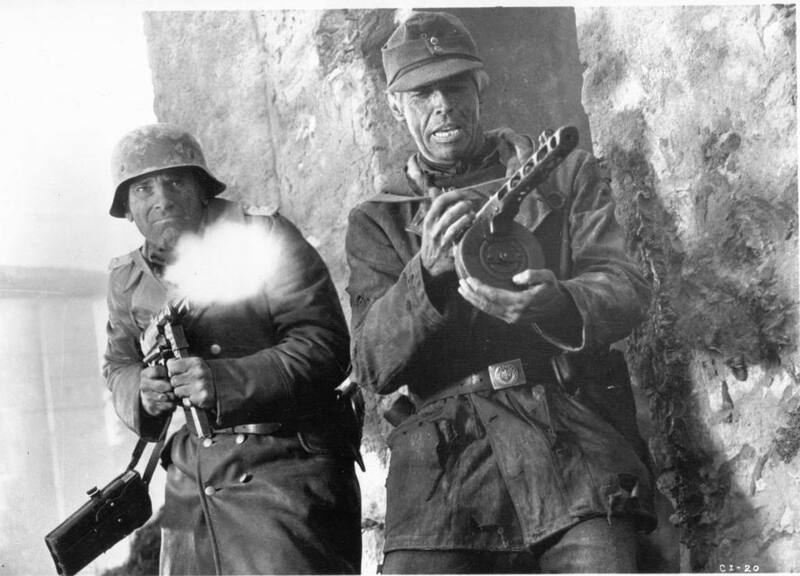 From the get-go this film is slightly different from most other WWII works because it focuses on the exploits of German soldiers — particularly the bureaucratic conflict between an ambitious but cruel captain (played by Maximilian Schell) and one of his sergeants (played by James Coburn). Whereas the former comes from an aristocratic class and has his sights set on personal glory, the latter is a blue-collar leader-of-men who will do anything to serve and protect those in his command. [This class conflict between the higher-level officers and lower-level officers, between those commanding from the safety of a war-room and those commanding from the front-line, is very reminiscent of Stanley Kubrick’s phenomenal WWI flick Paths of Glory, if you’ve ever seen that film.] The film takes a bleak look at the costs of war and, I think, ultimately decides that humankind is more or less fucked to repeat its absurd acts of atrocity on one another forever. What sets this film apart from other WWII era flicks is not only this overriding nihilism but also its embrace of irony / sarcasm as means of ridiculing humans — most notably seen in the opening credits with the juxtaposition of a children’s song with images of wartime horrors. Moreover, I cannot think of another film that presents PTSD in such a emotionally evocative, visually memorable way — particularly during a scene in which Coburn’s character (Steiner) has sustained a head injury and is recovering in a hospital, as Peckinpah’s filming and editing during this scene manipulate time/space, interweaving reality, hallucination, and dream-logic with truly remarkable results. To my mind, this is THE most underrated work in Peckinpah’s oeuvre, and a film that any viewer interested in war cinema and/or trauma studies should definitely track down and watch. Junior Bonner (1972) – In the #4 spot on my list of Peckinpah’s films is one that I imagine most people probably haven’t seen — one of the director’s mid-career films that was mostly unsuccessful upon its release, Junior Bonner. 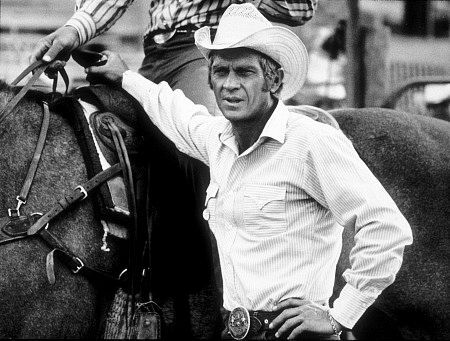 Anchored by a strong and more emotionally nuanced portrayal than I’m used to from Steve McQueen as the title character, Junior Bonner is about a man from a famous rodeo family, and his personal quest to conquer an “unrideable” bull (ironically named “Sunshine”). As he travels for the rodeo show, he tries to woo the ladies, reconcile with his drunkard / legendary father, and compromise with his business-minded brother. Stylistically, Peckinpah’s penchant for slow-motion works really well with the bull-riding, cattle-wrangling, etc., adding to the “mythic” quality of the rodeo (as struggle between man and nature) but also allows the underlying humor of those same actions to come through as well. Moreover, Peckinpah plays around with having multiple panels simultaneously within the same frame of film, so, at times, the visual aesthetic takes on a kind of comic-book look/feel, which really works here. But to me, the most interesting aspect of Junior Bonner is its surprising warmth and generosity. 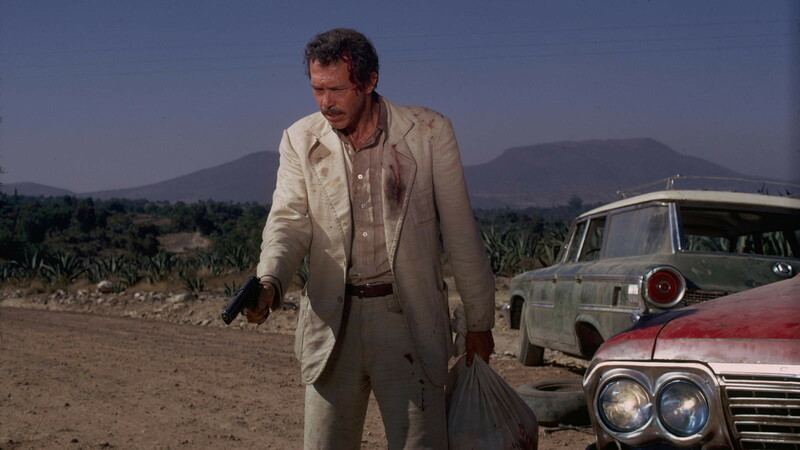 If you watch a lot of Peckinpah in a short amount of time (as I was doing for this retrospective), you get accustomed to the director’s typical violence and pessimism — to the point where you come to expect those characteristics (for better or worse). What a remarkable experience, then, to watch a film like Junior Bonner, in which the main character engages with other characters in an empathetic manner! Truly a film that fans of Peckinpah ought to watch as an example of how this director had the ability/talent to vary his tone, though he obviously didn’t do that very often. I’ve already mentioned two films above (i.e. Cross of Iron and Junior Bonner) that I think are very underrated among casual viewers, but let’s think about our other options here. Ride the High Country was a film that I enjoyed more than I expected to; and, with its exploration of friendship, obligation, and obsoleteness, you can sorta see how it lays the framework for Peckinpah’s better films (especially The Wild Bunch). Probably the Peckinpah film that I feel the most ambivalent about is his Straw Dogs. Honestly, I didn’t really care much for that film while I was watching (after all, it’s a VERY problematic movie on several levels), but it has sorta lingered in my mind ever since — to the point that, although I don’t think I “liked” Straw Dogs, I do think it has some interesting thematic things going on. [It’s hard to believe, but it’s probably Peckinpah’s most “pessimistic” film.] But my pick here is another film that has grown on me since watching it: The Ballad of Cable Hogue (1970). This particular film also uses the American West as its setting; however, the tone is more comedic — in fact, it’s the most comedic film in Peckinpah’s career. While much of the humor doesn’t really work for me (it’s equal parts sleazy and slapstick), I was intrigued by several of the performances — most notably, Jason Robards, Stella Stevens, and (Peckinpah regular) David Warner. They most definitely are not “good” people, but you do end up caring about them; and Hogue’s character-arc (from coward to killer to savior, from being driven by revenge to accepting a kind of reconciliation) leads to a surprisingly honest and moving conclusion. Depending on what you read, The Ballad of Cable Hogue was later regarded by Peckinpah as the favorite among his own films, so you can definitely get a sense of the director’s personality and preoccupations from watching it. So…Peckinpah is one of those directors whose work, by and large, I tend to either really like or really…not like. Therefore, there’s a lot of contenders her for films that I think you could probably skip. I found Major Dundee to be forgettable, although I’m also not much of a Charlton Heston fan so maybe I was predisposed to be disappointed in this particular film. A lot of people like The Getaway — Peckinpah’s bank-heist film starring Steve McQueen — and while I was really intrigued by the film’s opening scenes of the soul-crushing tedium of prison life, I became less and less interested in the movie as it progressed. Both The Killer Elite and The Osterman Weekend feature good casts (e.g. James Caan and Robert Duvall in the first film, and Rutger Hauer, John Hurt, Dennis Hopper, etc. in the second film); however, both those efforts feel pretty cheesy with a TV-movie quality to them. But my pick here is Peckinpah’s first feature-length film, The Deadly Companions (1961). While even Peckinpah’s bad films often are mildly entertaining in spite of (or because of?) their penchant for being sorta bonkers, I just found The Deadly Companions mostly forgettable. Peckinpah’s other Westerns are much better than this — his first film — so it suffers by virtue of comparison. If you’re interested in venturing into Peckinpah’s work, then I’d suggest that you start with the best of the bunch…The Wild Bunch, that is. [PUN!] It really is, I think, Peckinpah’s masterpiece and a great primer into the best and most Peckinpah-ish aspects of his work — both stylistically and thematically. Plus, it’s also one of the best Westerns ever — definitely in my personal “Top 10 Favorite Westerns” list and maybe even in the “top 5.” If you like The Wild Bunch, then be sure to also checkout (most of) Peckinpah’s other Westerns: Ride the High Country, Pat Garrett & Billy the Kid, and The Ballad of Cable Hogue. [The first is a more traditional, but also sorta off-kilter, Western. The middle is one of Peckinpah’s most lyrical and meditative films in my mind. The last is a Western quasi-comedy with some good performances and some commentary about how “community” is established, even in wild places.] Then, if you’re up for it, perhaps venture into Peckinpah’s more pessimistic works like Bring Me the Head of Alfredo Garcia, Cross of Iron, and Straw Dogs. In many ways, Peckinpah is an extremely difficult director and one who I feel intensely ambivalent about. On the one hand, you can certainly see his eye for iconic imagery and visual spectacle, and I think that he does explore some complicated (albeit, now somewhat antiquated) themes of gender, age, class, etc. etc. On the other hand, he sounds like a terror of a person, someone who consistently abused his performers and behaved somewhat irresponsibly toward his employers. By all accounts, his addictions made him very difficult to work with and severely limited his cinematic output — partially because his drinking resulted in him only being able to work for a few hours/day and partially because he burned bridges with nearly everyone in Hollywood through his very bad behavior. And yet, despite all that, he did help invent a highly recognizable style that would go on to influence many other directors, and he also created 1-2 legitimate “masterpieces” and 3-4 other excellent films — so, in considering filmmaking in the 1960-1970s (and its subsequent influence), you likely have to wrestle with Peckinpah at some point or another.